Just been unwinding and whatnot. Its been a long week at work, and a bad week in general for the whole world! I think I solved my problem! New yarn - Mmmmmmalabrigo in Cypress. I know its an icky cell phone picture (apparently we're out of AA batteries. Durn Wiimotes) but if you look at the 3 top rows... The 3rd and top row are both in the new yarn. The middle row is in the old yarn. The darkest shades of green of the old yarn PERFECTLY match the new yarn! I think the darker part at the bottom will really make those evergreen spots POP when its done. Speaking of Mmmmmmmalabrigo (once you pop you really can't stop) I found another perfect match for the other skein of handdyed that I had made. This set will be a Vortex Shawl for my aunt. While she was in town for my wedding she mentioned that she keeps her house very cold because she is so hot-natured, but that her shoulders get cold. 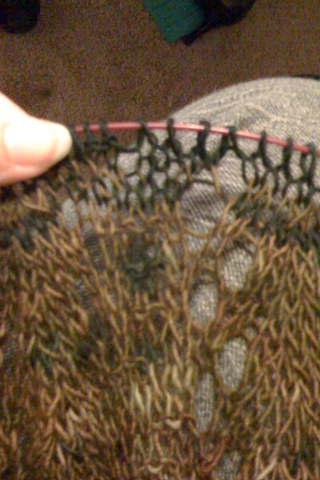 Also, I think from now on I will only knit circular shawls. I HATE PURLING! Anywho... I took care of name change stuff today. Once my drivers license and new bank stuff comes in the mail I'll be 100% Officially Mrs. S! I love the Stonechat..I have a skein too..thought socks originally but since the sock treasure chest is full..a shawl will be nice..pretty colors! 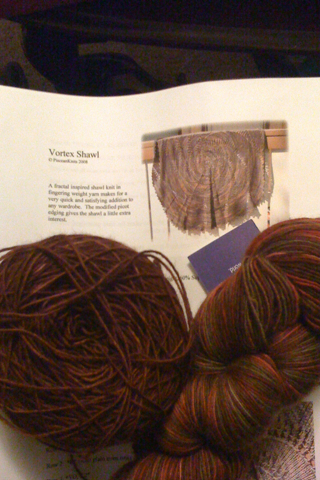 Stonechat is gorgeous - - I love autumn-y colors and green. The Cypress and your handdyed look like a wonderful combination to me!